Heather Nova News : New date for Heather Nova on French show "Taratara"
Heather Nova's appearance at the French show "Taratara" will be already aired on January 13, 2012 on tv station "France 2" and on mytaratata.com. The recording took place on November 7, 2011 in Paris. She performed "Higher Ground" and a duet (cover from Bruce Springsteen's song "No Surrender") with Belgian singer Milow. Thanks to Rero for the new date! 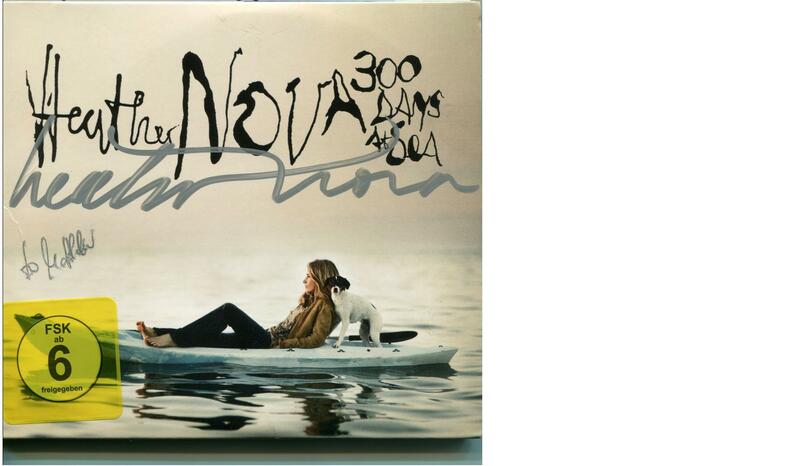 Heather Nova News : Happy New Year! message was sent to me to forward to you. Thanks Heather! Heather added a date in Breda, Netherlands, in her tourplan. She will play at venue Mezz on Sunday, March 25, 2012. 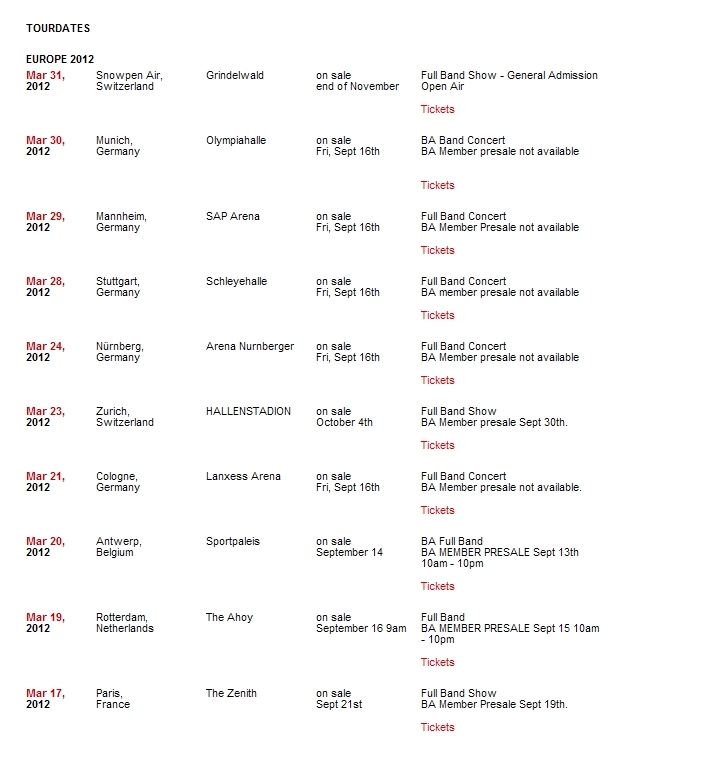 In addition to the spring tour 2012 dates that were known so far (Link), there will be a concert in Hamburg, Germany, on April 1, 2012, at Markthalle. The German TV station WDR will show Heather Nova at "Rockpalast: Rolling Stone Weekender" in the night from Saturday, December 3rd, to Sunday, December 4th, between 0:25am and 3:25am. Likely from Christmas on, there will be a longer version of her concert in the Rockpalast Mediathek. Like last year, Heather Nova stopped on her fall tour 2011 in hospitals, mostly in departements of psychiatry and psychotherapy, by giving free acoustic concerts (with Arnulf Lindner on cello) for the patients. These concerts weren't available for public. In an "OpenMag" interview in 2007, Heather stated: "i have always had the idea to bring music into hospitals. they are supposedly places of healing, but i don't feel the energy of healing when i go into a hospital, in fact i feel small and fearful. healing takes place on many levels, physical yes, but also emotional and spiritual. i think music could help with the latter two." Together with Thomas Hahn from the "Agency for social artists", who has already organized the hospital concerts last year, this idea could be fulfilled again. Here you can see a short documentation made by German TV station "SWR" about Heather Nova doing a concert in the "Robert Bosch Hospital" in Stuttgart. Also Thomas Hahn is being interviewed. "this is a project i have been thinking about for some time. i call it "living music" and my idea was to bring live music to those who are too ill to go to a concert. i feel that hospitals are places where people go to get well, but that often some of the elements needed to FEEL well on all levels are missing in hospitals. it is my feeling that music can relax and stimulate the senses and emotions in a way that is beneficial to the whole being and therefore it can play a part in the overall healing and wellbeing of a patient, even if it is in a small way. but even if all it does is give pleasure to someone and allow them half an hour of enjoyment and a break from the stress of their situation, that is enough too. so when i am on tour i stop in at hospitals in some of the cities i am playing, and give informal acoustic gigs to those who want to listen. it is all done on a volunteer basis, no fees involved, in the spirit of a simple sharing of music. " Heather Nova News : Heather Nova on French show "Taratara"
Heather Nova's appearance at the French show "Taratara" will be aired on January 13, 2012 on tv station "France 2" and on mytaratata.com. Edited 02-Jan-2012 with new date: Thanks to Rero! We have more dates for the Heather Nova Spring Tour 2012! It seems she will do support for Bryan Adams, but also do own concerts! Note: all concerts are not confirmed so far. It isn't official yet that she actually is support for Bryan Adams on all his concert days, but she said so. For her own concerts, tickets are sometimes already on sale (look at livenation.be, livenation.nl or the venues websites). For Bryan Adams concerts, tickets are on sale. Thu, March 22, 2012 ? Sun, March 25, 2012 ? Tue, March 27, 2012 ? Sun, April 1, 2012 ? Of course, she needs rest days / promo days between, so the days without concerts so far, may or may not be filled with other concerts. Also it is possible that there may added dates before March 17 or after April 2. Due to the fact this was a festival concert, Heather Nova played a reduced set of 12 songs. Heather Nova News : Heather at French show "Taratata"
Heather was in Paris on November 7, 2011, to record the "Taratata" tv show there. She performed "Higher Ground" and a duet (cover from Bruce Springsteen's song "No Surrender") with Belgian singer Milow. The complete program (with other artists, too) will probably be aired in January 2012 and streamed on mytaratata.com. Heather Nova will play at Vooruit in Ghent, Belgium, on Sunday, March 18, 2012. This will be a full band show. Tickets can already be bought at Livenation.be. Heather Nova Concert News : Heather Nova Fall Tour 2011 starting tomorrow! Don't forget, the Heather Nova fall tour 2011 is starting tomorrow! The concerts will be with full band. On heathernova.com, you will be able to download mp3's from the concerts for 10 Euros each. Paypal or credit card. Heather Nova will be supporting act for Bryan Adams during his European tour in March 2012. If you know any music stores that sells the single to people especially in UK or US, please tell us! The song "Drive Away" was only available on Pledgemusic so far, it seems to be the same version. "Maybe Tomorrow" is likely from Leiden, October 15, 2010. "Ride" is likely from Breda, October 11, 2010. For some fall tour concerts, there will be exclusive "VIP upgrades" available. - only VIP upgrades are sold, they include NO ticket for the show. You have to buy a ticket for the show separately. Therefore the VIP upgrades do not include "premium seating" or such anymore. 2) One Commemorative VIP laminate with keychain or caribiner. - VIP upgrades are available for: Oslo, Stockholm, Copenhagen, Berlin, Bielefeld, Cologne, Eindhoven, Paris, Munich, Vienna, Zurich, Luxembourg, and London. 300days-at-sea : More info about new single "Beautiful Ride"
According to "Guerilla Music Promotion", there will be a new single "Beautiful Ride" on September 30! Canadian singer/songwriter Sara Johnston will be the support act for Heather on the fall 2011 tour. Sara Johnston is a member of Bran Van 3000, and she is Heather Nova's cousin! Today finally the tickets for the Crossing Border festival in Antwerp went on sale. Heather Nova plays there on November 19, 2011! Heather Nova will play in Zurich, Switzerland, at club Kaufleuten on November 25, 2011. Tickets are already on sale! Heather Nova Concert News : Short summer tour this week! Don't forget that Heather Nova will play this week three times with full band in Europe! The second part of the TV Noir show with Heather Nova and Jonas David, recorded June 5 at "Heimathafen Neukölln" in Berlin, was shown on July 8 on the German TV channel "zdf.kultur". It is the same version as shown on television. Please note that "TV Noir" intentionally airs its program in black/white format, so this is no mistake. Today, the Heather Nova unplugged concert with Arnulf Lindner from May 26, 2011 in Saarbrücken was aired on German radio station SR1. The setlist: Walk This World / Beautiful Ride / Heart And Shoulder / Save A Little Piece Of Tomorrow / Everything Changes / Like Lovers Do / Someone New / Turn The Compass Round / London Rain / Burning To Love / Stop The Fire / Island / Higher Ground (faded out). Don't forget: tomorrow (July 8) the second part of the television show "TV Noir" will be aired on German television channel zdf.kultur and on tvnoir.de. The unplugged Heather Nova concert from May 26, 2011 in Saarbrücken will be broadcast on German radio station SR1 already on Thursday, July 7 (not July 14! ), from 9pm till 10pm. This is not an April Fools joke! Heather Nova has really made Drive Away part of her final PledgeMusic update. As someone who has asked for this song for years now, I just want to personally thank Heather Nova for releasing this song. It's wonderful! i want to give you a final gift to thank you for your ongoing support and patience during my pledge campaign. i loved making all the exclusive items for you, and i hope you're enjoying the new album. "flowers and blood" is a song i wrote during the "jasmine flower" period that never made it onto the album. "drive away" is a song i wrote during the "south" period that never made it onto the album. and i have also included my original demo of "motherland". i hope you enjoy them, and thank you again for helping me get this record out. These tracks are available only to Pledgers. by now you will have received a personal letter of apology from my manager, but i would like to again address this very ugly situation of the false signatures that went out on some of the cd/dvds that were ordered on pledge. i cant tell you how sad and sick and angry i feel over the whole thing. my fans are so important to me and integrity has always been my priority both in my personal and professional life, so this has really hit me hard. you and i have both been very let down by this. what really makes me sad is that i literally spent weeks working on the pledge items - making all the hand painted tshirts, lyric sheets, hand painted cd covers etc, and taking the time to make them all special because it's important to me to give something of high quality. now that this has happened with the cds it has made some people wonder about the authenticity of all of it. let me assure you that every pledge item that was sent out was authentic aside from the group of special edition cds that went out with fake signatures. i hope this will reset the atmosphere back to one of trust between us. i value your support and your loyalty and i hope that we can leave this incident in the past and focus on the positive - namely, the music. i would like to add that although this was totally unethical behaviour on the part of my management, they are doing their best to rectify the situation and are very sorry indeed. many of you have asked if i will be firing my management but i will not. i had to look at the big picture and take all things into consideration. sometimes things like this are a wake-up call, and i believe that my management has learned from this and won't ever do anything like it again. at least not on my watch! in this case i felt that to forgive and move on (and make sure the damage was taken care of) was the best action. i hope you will too. in all other areas they are doing a great job. once again, thank you so very much for your support, and I am deeply sorry for this unfortunate situation. During her European promo trip, Heather worked hard for several days signing all the cds and cd/dvds. When the album was released and Heather flew back to Bermuda, we started to fulfill all pledges and send out the packages. However – due to some internal chaos, we ran out of Heather's signed cds, and consequently some items went out with the wrong signature. This only affects a few of the Special Edition CDs (nothing else) and the amount of items involved was minimal. Of course this is still totally unacceptable and I, as the owner of the management company, must take full responsibility for this. Also I want to make it clear that Heather was in no way involved in the problem with the wrong signatures, and knew nothing about it until now. She is understandably very upset as she spent a lot of time making all her pledge items, and wanted them all to be special for her fans. Therefore, if you think you received one of the CDs with a wrong signature, please contact me directly on: ulysses@halbemiete.com. We have now ordered more CDs and Heather will sign them as soon as she is back in Europe in July. We will be sure to get these out to you as soon as possible so that you receive the original CD in its intended condition. Apart from the above, all pledges have now been sent out except for the framed artwork and framed poster orders - this is due to some problems with the company providing the frames. We know that the correct frames will be in very soon, so we can send out these orders ASAP. In the event that you pledged for extra pieces besides the framed artwork or picture, and you would like to have the smaller items sent separately, again, please contact me directly so I can take care of the shipment. Alternatively, if you would rather not wait any longer and wish to cancel the pledge for the framed picture we can obviously also arrange this. Thanks so much for supporting Heather on her new album. Again, please accept my sincere apologies for the the embarrassing situation with the signed Ltd. Edition CDs. Some people recently ordered a signed Heather Nova CD or CD/DVD via Pledgemusic, but got an item with a fake signature. i agree with you - it is totally unethical, and i promise you i will get to the bottom of how/why this happened and make sure you receive one that has been genuinely signed by myself. i am just wondering where all my signed ones went. it is totally bizarre. i think you are aware of how much respect and appreciation i have for my fans. i would never jeopardize the loyalty of my fans by authorizing something like this and i'm deeply upset that this has happened in association with my name and my music. i have put in a call to my manager and am awaiting his reply. hopefully he will be able to shed some light on what has happened and why. my sincere apologies, on behalf of whomever is responsible, that you were treated in this way. Tickets can already be bought at eventim.se.